Home > Bakar > Festivals > Holi > Thoughts > Bura na Mano - Holi Hai !! Bura na Mano - Holi Hai !! First of all, I wish all of my readers and non-readers a very Happy Holi. May this festival fill your lives with loads of colors, joy and energy. It is time of the year when the enthusiasm gains new heights. Winters are over giving everyone a sigh of relief and with the spring season comes the festival of colors – Holi. While each festival has its own significance and importance, Holi brings in a completely different level of highs with it. It is one festival where one sheds all inhibitions, forgets how one looks, demolishes the barriers of society when accepting colors and gender bias seems irrelevant. All parts of the society are welcomed with equal fervor to celebrate with splash of colors. Devar-bhabhis, jeeja-saalis, newly married couples and to be married prospects – all put in their best to enjoy their special relation on this occasion. Squirting colored water on passers-by, dunking friends in mud pool, teasing, laughter and intoxicating oneself on bhaang is perfectly acceptable on this day even in relatively conservative Indian society. All amidst chants of – Bura na Mano, Holi Hai (Don’t mind, its Holi)!! As with most of the festivals of India and probably world, there are a few traditional stories attached to this one too. Legend has it that it derives its name from Holika, the sister of the mythical megalomaniac king Hiranyakaship who commanded everyone to worship him. But his little son Prahlad refused to do so which led the king to order his sister (who was supposedly immune to damage from fire) to sit in fire with the son. Chanting names of God apparently saved Prahalad while Holika perished as the immunity was only applicable if she entered fire alone. Also, separately it is often believed that it was on this day that Lord Shiva opened his third eye and incinerated Kamadeva, the god of love, to death. In many parts of the country, Holi is also celebrated in memory of the immortal love of Lord Krishna and Radha. The festival is celebrated in multiple parts – puja, playing and get-togethers. While on the eve of actual celebrations bon-fires are organized at various places mostly at community levels. People from the area / community come together to parch fresh grains in the bonfire and celebrate good harvest. It is a sweet gesture symbolic of the entire nation celebrating the joy that is about to arrive in families of the farmers across the country when they get paid for their work when the new crops comes to the markets. Next day is what brings the actual celebrations and is truely boisterous in nature where people come out of houses in tolis along with dhols and nagadas (big drums), splashed with multiple colors and singing folk songs. The entire air is full of colors and there is no space for melancholy for anyone. It is one time when no one minds naughty pranks and generous liberties are allowed. Amidst all this, people visit their near and dear ones to wish and bond over sweets and colors. Amidst all this when I think of how this colorful day has changed for me over the years, it brings in mixed feelings. While the earliest of times of slight fear of the color and unknown ghosts (as people used to look) passed, the thoughts of the naughty childhood when we played with pichkaris and water-colors linger on. This was then taken over by celebrations at schools where the margins of naughtiness could rise to a certain level along with the opportunity to color that part of the school-society with whom you were hesitant to even interact. These opportunities often cascaded and gave rise to many new opportunities, interactions, friendships and memories. Then there were the board exams which persistently played spoilsport to the enjoyments when we were neck deep in pile of books when the entire world around us were splashing colors. 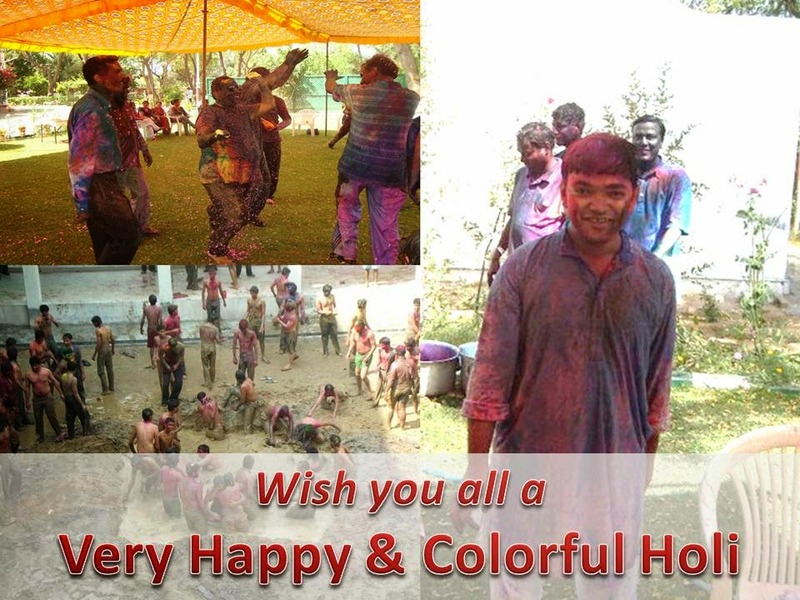 However, the scene changed drastically as we moved to colleges and there Holi had a different meaning altogether. The occasion was much awaited one and special preparations were done for its celebrations. While the celebrations at IIMB were more restrained, ones at IITG had no bound. Everyone had to participate and a dip in the holy pond – dug up overnight by freshers and filled with mud and colors – was imminent for every resident of the campus. Now that we have moved out of the student life and entered this so called corporate life, the celebrations have become more “mature” if we could call it. The color and sweets are still a very much part of the day, but the hurdang has drastically reduced. No more are the ponds a reality nor is the forceful nature of involvement of people. We still move out of houses in tolis but leave it for people to join the gang rather than pulling them into it. Gentle requests to participate though are very much there to incentivize those hesitant ones!! Now that this day of colors is right here, I do feel that it illustrates a true symbolism of what our country stands for - Unity in Diversity – where various colors intermingle and splash over one another to bring in a generic identity for everyone part of the celebrations and all the barriers of color, status and others divisive criteria take a back seat. I do really wish that this festival continues to be as energetic as always and keeps bringing people like never before. Wishing you all a Very Happy and Colorful Holi and remember to Play safe! !